Autumn is a time of frantic industriousness....a rush of preparation for winter. and everything has flourished in abundance, especially the weeds! 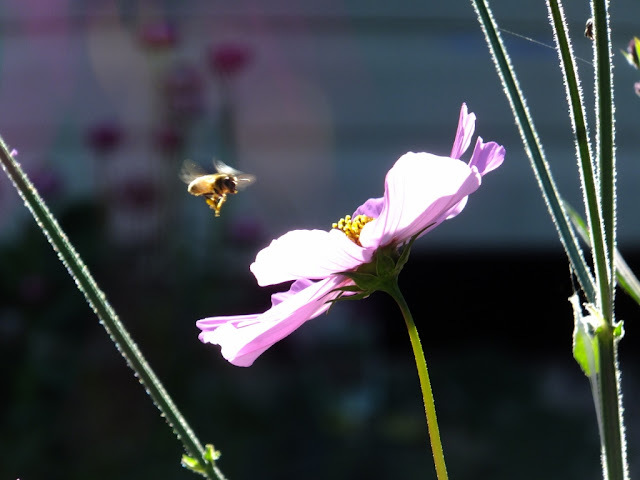 In the garden my cosmos, which I have grown for the very first time, are attracting the bees. Their buzzing is incessant and their busyness admirable. lull us into thinking we are doing what we should be when we're not. that just maybe we are letting slip by, or choosing to ignore. Wise words. Really makes a person consider the time! Yes Sandi...I sometimes wonder where it goes and the pace just seems to be picking up. Time for a bit of slow! I hear you on the delusion of busyiness. Guilty. Often. And am yearning to get back into the garden when my rotten hip allows it. Which is almost certainly an avoidance of other things I 'should' be doing. Sobeit. Oh poor you, I do hope your hip allows you back into your garden soon, nothing more frustrating. Yes, we're all guilty of avoidance aren't we! Jane it is glorious to see the cosmos and the bees as you work into autumn now....we are gearing up for spring and the flowers and bees return! Yes Donna, it's lovely to think of us all at different stages of the cycle, and great to be able to pop over and take a look at your spring with the click of a button! It is lovely to see your cosmos doing so well and attracting the bees. You're right about not rushing through life, it's so worthwhile to appreciate the beauty of every season. 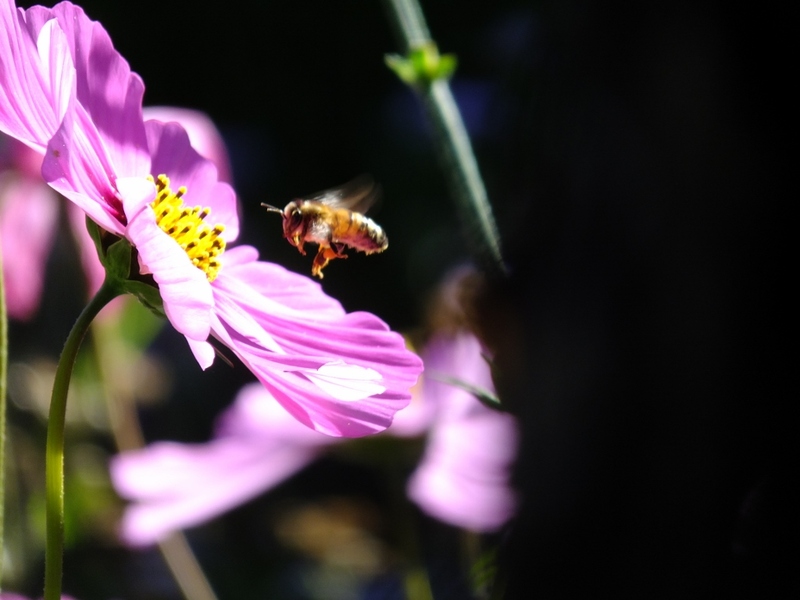 The bees have certainly been having a wonderful time on the cosmos, though it is just about over now, and I need to get down to a fair bit of digging. It's so nice to see you back here. The light from your cosmos is gorgeous. Thank you fro this beautiful post. Enjoy autumn lights. Thank you Amélie, it's good to be back. Yes, Autumn has a different look and feel doesn't it. Certainly chilly evenings now. So very true, discerning the important over the urgent - always a challenge. Beautiful photos Jane. Thank you so much Karen. It's getting chilly here now isn't it....autumn closing in to winter. 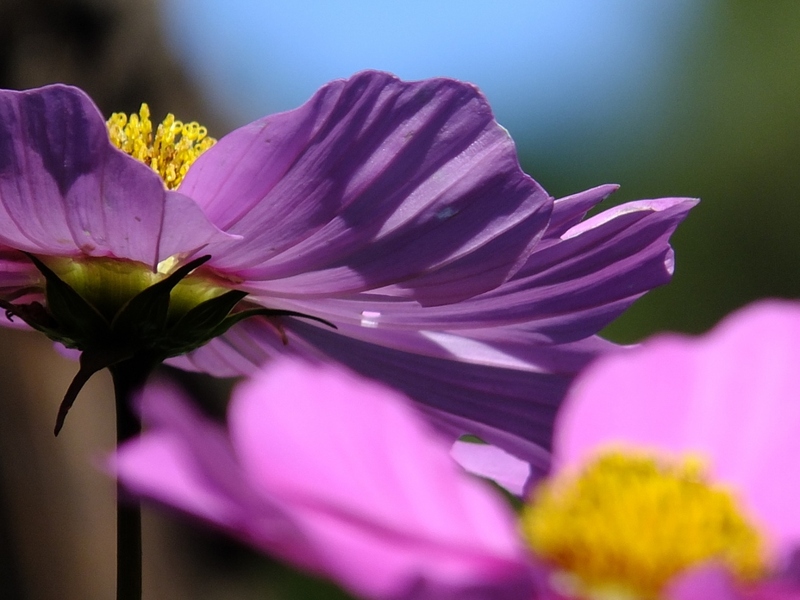 My cosmos are now on the compost heap! Beautiful photos Jane and wonderful words too. Bees have a wonderful way of causing me to stop and listen. Hovering there for you to click. That's exactly right Haddock! Just going about their business. Oh it's lovely to see you back, Jane, and with glorious, heart-swelling photos! I adore bees, but since I started blogging, they've also become a metaphor for how I feel about blogging and life itself. All the bloggers I know are like bees, visiting - and cross-pollenating - a variety of lovely places, attracted by what resonates and drawn to the folk whose company they simply delight in. Without genuine connection, none of us thrives. So glad you're back! Thank you so much Janice! I love your thoughts on blogger bees. So true. This little bee has been busy at home and it's time she goes visiting again.